No Indian meal is complete without one or more subzis. Whether lunch or dinner, the subzis play important roles in balancing the meal, not just in taste and texture but on the nutritional front too. Vegetables are nature's gift to us - low in calories but in rich in fibre, vitamins, minerals and antioxidants that help fight diseases. Nutritionists suggest that we should eat at least three to five servings of vegetables daily to fulfil our nutrient requirements. Unfortunately, traditional methods of cooking vegetables often use oodles of oil and unhealthy practices, drowning the goodness of the veggies in rich gravies or too much fat. This section on "Healthy Subzis" is a tool to avoid this! It shows you how to make a range of nutritious, low calorie and appetising subzis, which taste fabulous while still retaining the health benefits. 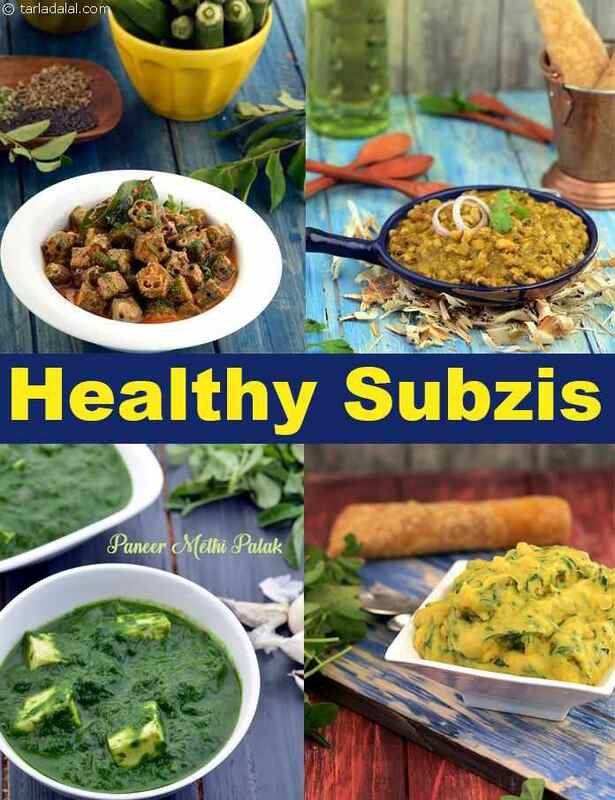 You will find healthy subzis clubbed into interesting sections like Subzis with Gravies, Subzis with Leafy Vegetables, Semi-Dry Subzis, Paneer Based like the Paneer Palak Koftas in Makhani Gravy, Dry Subzis and Subzis using Beans or Sprouts. This section features a variety of vegetables, from the most commonly used ones like onions, tomatoes, French beans, spinach and green peas to more uncommon ones like chawli bhaji, red pumpkin and ridge gourd. Enjoy our collection of Healthy Subzi recipes and other related articles below. Dry subzis do not have any gravy in it but are often loaded with oil. Healthy subzi’s in this section are prepared using minimal oil or no oil at all. Methi Pitla is a Maharashtrian recipe which is prepared using zero oil, a good protein, thiamine and folic acid rich recipe. Beetroot Subzi is a low calorie subzi great for those who are trying to lose weight. Try from our category of dry subzis on a daily basis with hot chapatis or rotis!! Make your meals protein rich with Paneer as it has high quality protein. You can try this amazing recipe of Stuffed-Bhindi-with-Paneer which is a unique one as usually bhindi is stuffed with besan or masalas. Both cauliflower and paneer are sober ingredients, with similar colour and blandness, and so you might not have thought of combining them in one subzi. However, the Cauliflower Paneer Subzi turns out to be a true winner! Enjoy our range of paneer recipes and make your meals protein and calcium rich. Soya is from one of the most recognized vegetable protein source. Soya is available in diverse forms like soyabeans, soya chunks, soya granules, soya milk and tofu (soya curd). Soya Bhurji is a protein-rich potion which is required for the growth and maintenance of muscles and immune cells whereas being rich in iron builds up hemoglobin. Rajasthani-Style-Kaddu-Aur-Soya-ki-Subzi is a healthier and protein rich version of the subzi as the original recipe uses potatoes instead of soya. So if you’re fond of soya then check out our section on Healthy Soya Subzis. When we think of gravies we often tend to imagine gravies with tomatoes and loaded with oil. You can make your gravies healthier by added different ingredients like Cauliflower, Spinach paste and avoid ingredients like cream and cashew to thicken your gravy. Kofta-Makhani is a delicious combination of tasty ingredients like beetroot, carrot and besan with a perfect blend of spices. This gravy is a power packed with Protein, Fibre, Vitamin A and Folic Acid. Methi Mutter Pasanda is a delicious looking gravy made using low fat curds and milk rather than using thick cream cauliflower paste is used which gives it a nice white colour. Try our other interesting gravy recipes and make good lifestyle changes. Green leafy vegetables are good sources of Iron, Vitamin A, Folic Acid and Vitamin C and should be included in our diet at least 2-3 times a week. Beetroot Tikkis in Spinach Gravy is a really good example of how green leafy vegetables can be used creatively as a part of the gravy. This recipe is an excellent source of Vitamin A, Riboflavin, Vitamin C, Calcium and Magnesium. Cauliflower Greens Methi and Palak Healthy Subzi is a wonderful low calorie subzi that is rich in Iron, Vitamin C and Vitamin A, a great option for those on a weight loss diet. Do try our amazing recipe collection and let us know your feedback. Enjoy our collection of Healthy Subzi recipes and other realted articles below.